Garlic Feast by Janice Sutton was gifted to us by Scott’s parents, who had it autographed by Janice Sutton. It won Australian Cookbook of the year last year (I think) and is full of recipes using garlic. Some of the recipes are easier than others, paticularly in relation to accessing certain types of garlic. I learnt, thanks to this book, that black garlic is a thing, and then I discovered that you can buy it at Coles Supermarkets. So I made my Macaroni and Cheese dish (after reading through and disregarding the one in this cookbook) with mushrooms and liquid smoke instead of bacon, and added black garlic. It was good. I only ended up making one recipe from this dish because slow roasting a lamb is a time intensive process and because it was only the three omnivores at home for the weekend. 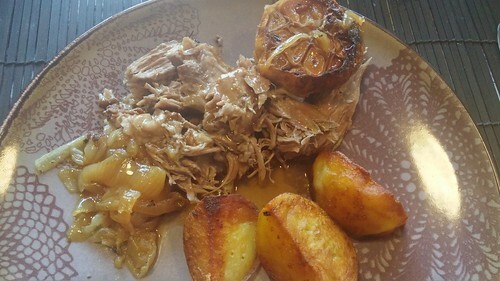 I served the roast lamb with roast potatoes that were beautifully cooked by Scott, and kept the leftover lamb, sauce and garlic to use at a later date (it ended up in a risotto). So far I’d give this book 4 out of 5 stars. The garlic was very nicely roasted as well, and I thoroughly enjoyed eating that. I have received a complaint by Ms Sutton regarding the use of the recipe on this blog. I received the complaint via my webhost (who are fantastic) and not directly. If you want me to remove a recipe/s of yours from my site, please contact me directly either via twitter @blue_bec or via the comments form on the recipe in question (if it is still open). If comments are closed, just email me rebecca[dot]dominguez[at]gmail[dot]com. I maintain that as I am reviewing cookbooks, my use of these recipes falls under the fair use provisions of Australian copyright law. When I substantially rewrite recipes (as I have done from time to time) then I believe that I would hold copyright to the new literary work. Also, never insult the person you’re asking to do something, it just causes bad feelings and ends up with complaints being published online.